There is nothing like the smell of baking with real coconut. Mmmm, the rich nutty fragrance holds the promise of tasty coconut pie or yummy macaroon treats. When your most beloved recipes call for coconut, why settle for conventional baking coconut, which is often laced with sugar, additives or preservatives? Now home bakers everywhere can choose Let's Do…Organic finely shredded coconut, and coconut flakes. Naturally rich in coconut fat, fiber and flavor, Let's Do…Organic coconut contains no added enhancers, extenders or preservatives - only pure organic coconut to make your recipes shine. Ingredients: Organic Coconut (shredded and dehydrated). Color may vary as this product contains no sulfites. Best coconut Iâ€™ve tried. Tastes sweet even without sugar! First time I've tried this coconut! Love the flavor and the fact that there is no preservatives! Will buy again! I cannot tolerate sweetened coconut. I love the flavour of this product. Best coconut I've found. It's amazing in everything. Love topping my protein shakes with this as a treat. Best coconut I've tried! Great flavour and natural sweetness and a nice fine grate. My fav! I keep buying & buying! I like it, pure coconut! This is one of my favourite brands for unsweetened coconut. It doesn't have any preservatives - JUST dried coconut! Check the labels on the coconut you buy in the store, you'd be surprised! Great to have found just coconut! I've bought this before and think it's the best shredded coconut ever. I bought a cheaper one locally and it didn't compare. Since I have a sensitivity to preservatives, I prefer to buy organic unsulphered products. The Inari products are high quality and fresh. They keep very well without all those chemicals and are wonderful for my baking. I would highly recommend this product. First organic coconut I have found and it's delicious. Much better than store bought. We love the health benefits of coconut-especially when it is organic! 5 out of 5 stars! 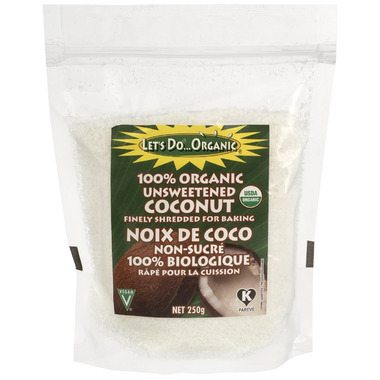 Love this product, so so much better than conventional shredded coconut you find at most grocery stores. Much fresher and more fragrant, great for baking, oatmeal or sprinkled on anything. Will definitely repurchase!